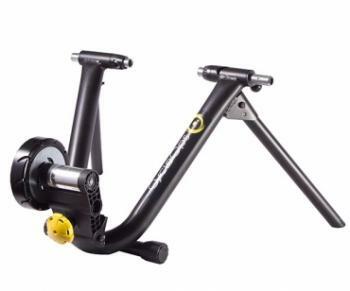 The CycleOps Magneto is a lightweight, magnetic turbo trainer that’s strong, quiet, and pretty easy to set up. 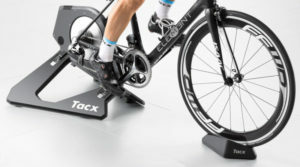 Being the world's first (and perhaps, the only) magnetic trainer with progressive resistance, that increases resistance with the pedal’s speed. The progressive resistance negates the need for manual adjustments or external shifting of the devices resistance. In essence, the Magneto is comparable to classic wind or fluid brake turbo trainers in that resistance increases with pedaling speed rather than by physically increasing the resistance via a lever or computer. However, using a magnetic break means the noise will generally be lower. The Magneto provides a smooth, low noise ride and sturdy steel frame, and like all CycleOps trainers it comes with a lifetime warranty. The Magneto trainer also includes a wide variety of accessories from a race day multi-regional DVD to riser blocks and trainer mats.